Download "Master of Accountancy Proposed Program Changes - To Be Effective Fall 2007"
4 ACC 520 Tax Planning (3,0,3) Impact of income tax on business entities, including corporations, S corporations, partnerships, limited liability companies and sole proprietors; gross income deductions, accounting periods, accounting methods and property transactions. PREREQ: Admission to the MACC program, ACC 200 and ACC 201, or permission of MACC Director ACC 530 Accounting for Non-Profit Institutions (3,0,3) Problems of control of funds and other assets; accounting classifications and relationships; planning, performance measurement, reporting and auditing from the viewpoint of the non-profit (including governmental) organization. Prereq: Admission to the MACC program, ACC 301 or graduate equivalent, or permission of MACC Director (3,0,3) Financial accounting theory and practice in determination of income and valuation of assets, liabilities and equities for external reporting in general purpose financial statements. Not open to students with credit for ACC 300 and ACC 301. 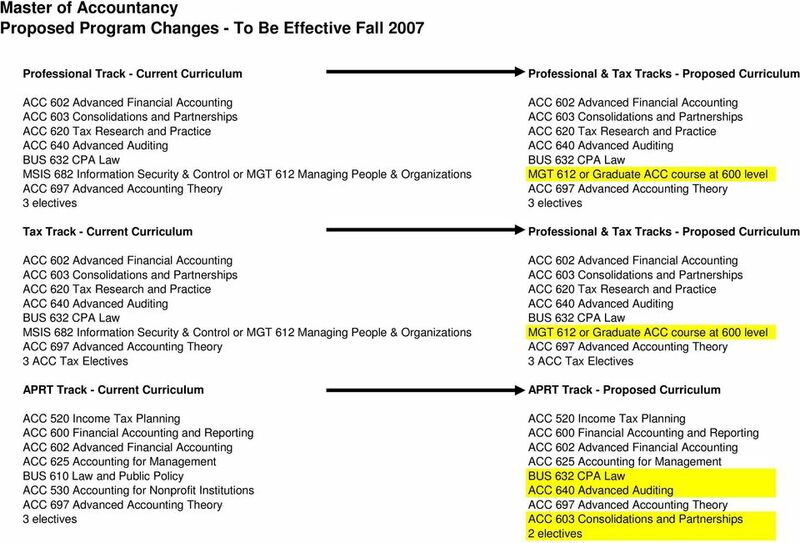 ACC 605 Introduction to Financial Accounting (2,0,2) Preparation and interpretation of primary financial statements. ACC 601 Management Control Systems (3,0,3) Overall design of control systems and the behavioral and motivational impact on managers and employees of such systems; development of a management information system; design of compensation/incentive schemes, divisional control, work measurement vs. discretionary cost approach to cost control, budgetary control, internal control, and performance reporting. PREREQ: ACC 600. (3,0,3) Financial accounting topics for external reporting; international accounting; financial statement analysis. PREREQ: admission to graduate program; ACC 600 or equivalent. (3,0,3) Accounting for mergers, consolidations, acquisitions, and partnerships. PREREQ: admission to graduate program; ACC 600 or equivalent. the last semester, or within 9 credit hours of graduation. (3,0,3) Methodology and sources of tax research; tax analysis research, policy implications, behavioral aspects, and use of quantitative analysis. Open only to students admitted to graduate program. PREREQ: completion of undergraduate course(s) in individual and business taxation. (3,0,3) Communication, interpretation, analysis, and use of accounting information for the benefit of management; financial statement analysis, cost analysis, budgetary control, standard cost systems, and capital budgeting. Open only to students in graduate business programs. 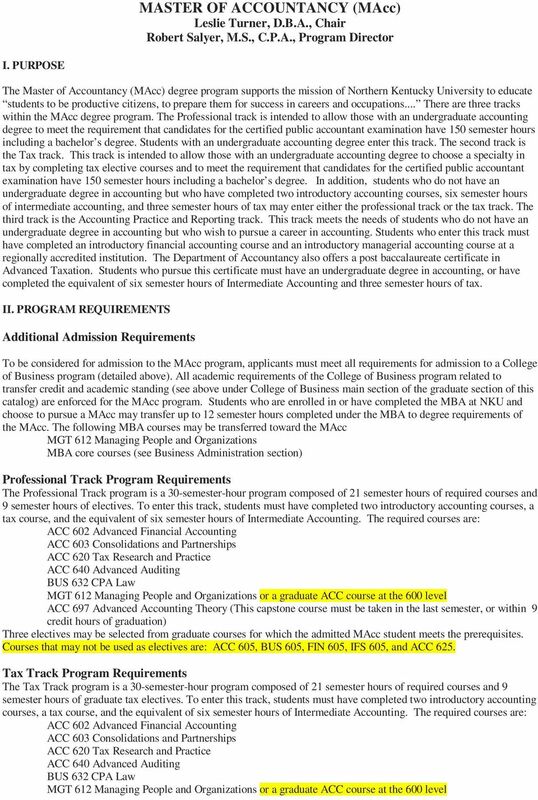 PREREQ: ACC 605 or equivalent, or consent of MBA director. ACC 630 Federal Taxation of Corporations (3,0,3) Corporate Taxation and topics concerning organization of the corporation, capital structure, debt vs. equity, dividends, stock redemption, liquidations, corporate divisions, corporate reorganizations. 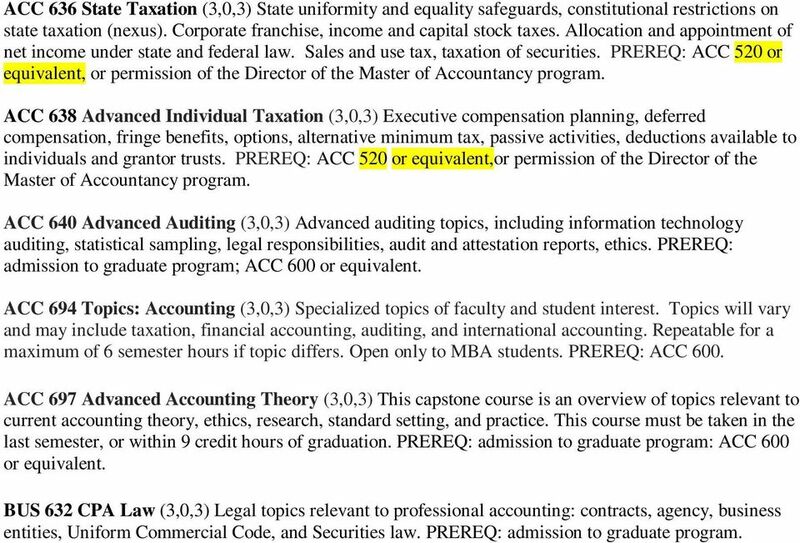 PREREQ: ACC 520 or equivalent, or permission of the Director of the Master of Accountancy program. ACC 632 Tax Accounting Methods (3,0,3) Methods of accounting, installment sales, inventories, LIFO, manufacturing, accounting method changes, accounting principle. PREREQ: ACC 520 or equivalent,or permission of the Director of the Master of Accountancy program. ACC 634 Taxation of Partnerships and Pass Through Entities (3,0,3) Concepts of partnership taxation including contributions of property and services. Partner basis, partnership liabilities, distributions sales or exchanges of partner s interest. Election of S corporation status, distribution to shareholders, liquidation, sales of corporation. PREREQ: ACC 520 or equivalent,or permission of the Director of the Master of Accountancy program. 5 ACC 636 State Taxation (3,0,3) State uniformity and equality safeguards, constitutional restrictions on state taxation (nexus). Corporate franchise, income and capital stock taxes. Allocation and appointment of net income under state and federal law. Sales and use tax, taxation of securities. 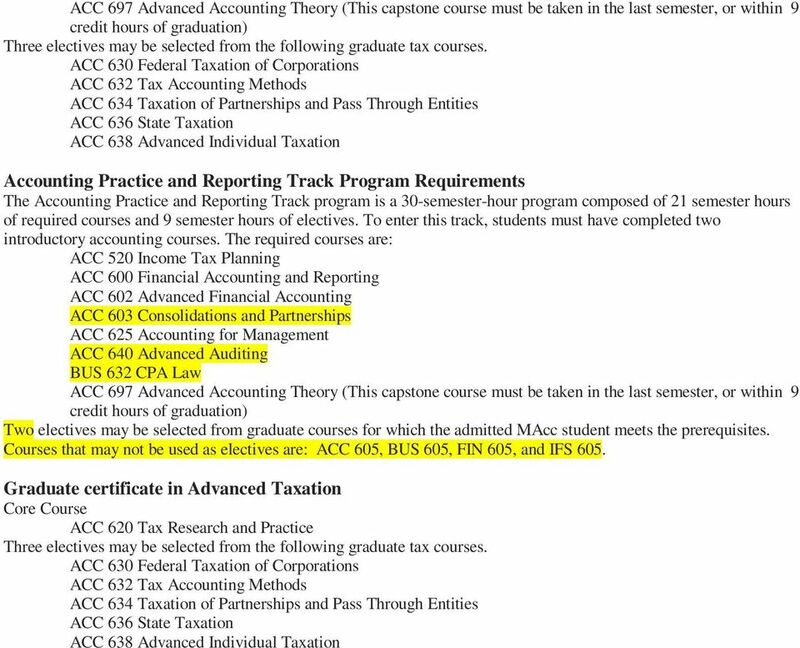 PREREQ: ACC 520 or equivalent, or permission of the Director of the Master of Accountancy program. ACC 638 Advanced Individual Taxation (3,0,3) Executive compensation planning, deferred compensation, fringe benefits, options, alternative minimum tax, passive activities, deductions available to individuals and grantor trusts. PREREQ: ACC 520 or equivalent,or permission of the Director of the Master of Accountancy program. (3,0,3) Advanced auditing topics, including information technology auditing, statistical sampling, legal responsibilities, audit and attestation reports, ethics. PREREQ: admission to graduate program; ACC 600 or equivalent. 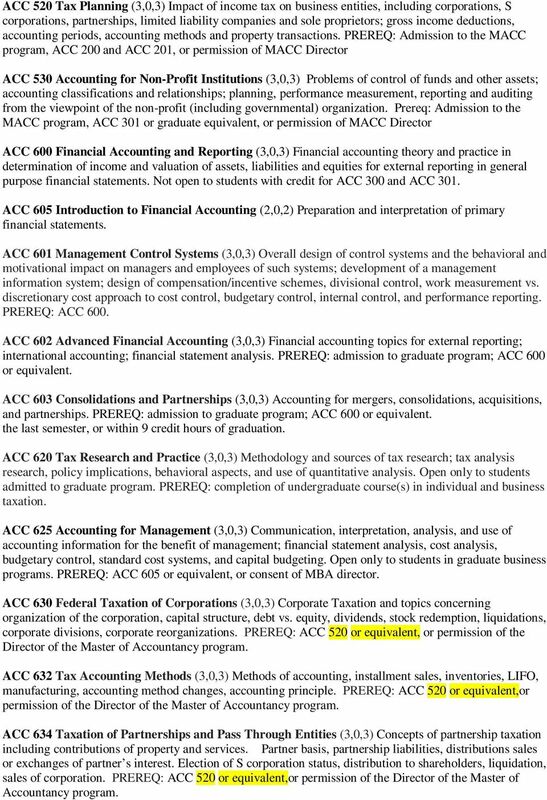 ACC 694 Topics: Accounting (3,0,3) Specialized topics of faculty and student interest. Topics will vary and may include taxation, financial accounting, auditing, and international accounting. Repeatable for a maximum of 6 semester hours if topic differs. Open only to MBA students. PREREQ: ACC 600. (3,0,3) This capstone course is an overview of topics relevant to current accounting theory, ethics, research, standard setting, and practice. This course must be taken in the last semester, or within 9 credit hours of graduation. PREREQ: admission to graduate program: ACC 600 or equivalent. (3,0,3) Legal topics relevant to professional accounting: contracts, agency, business entities, Uniform Commercial Code, and Securities law. PREREQ: admission to graduate program. All students must be proficient with a spreadsheet program and have the following courses (or their equivalent) prior to starting M.S. course work. Demonstrate an understanding of issues in areas of government and not-for-profit accounting, international transactions, taxation, and auditing. 79 ACCOUNTING AND BUSINESS Mission Consistent with the mission and purpose of Clarke University, the accounting and business department promotes ethical and collaborative scholarship and business practice.